Thanksgiving dinner is even better the second time around! Put those leftovers to work in this warm and wonderful Thanksgiving casserole recipe. Right about now you are probably smack in the middle of a Thanksgiving whirlwind, or you know somebody who is. The turkey is thawing or brining, the pumpkin pies are baking, you are searching for that cornbread stuffing recipe you know you have somewhere, and you’re sending someone to the store to pick up the marshmallows you forgot to get for the top of the sweet potato casserole. But in just a few days, after the bird is carved and we’ve had our firsts and seconds and thirds, after the football is watched and the naps are taken and the thanks has been given for family and friends and blessings of all kinds…after all that come the LEFTOVERS. And here’s where the fun really starts! Personally, I think that Thanksgiving leftovers are the champion of all leftovers. From pulling off a tidbit of cold turkey out of the Tupperware in the fridge all the way through eating that last slice of pumpkin pie for lunch, there’s just no topping Thanksgiving leftovers. And while the classic turkey sandwich is all kinds of wonderful, when the Sunday after Thanksgiving rolls around and you’re still gazing into a fridge full of mashed potatoes and stuffing and other goodies, that’s when it’s time for Thanksgiving casserole. This works best if you bring all your ingredients (which are all leftovers….no extra preparation needed!) to room temperature, so take them out of the fridge about an hour before you are going to pop this in the oven. 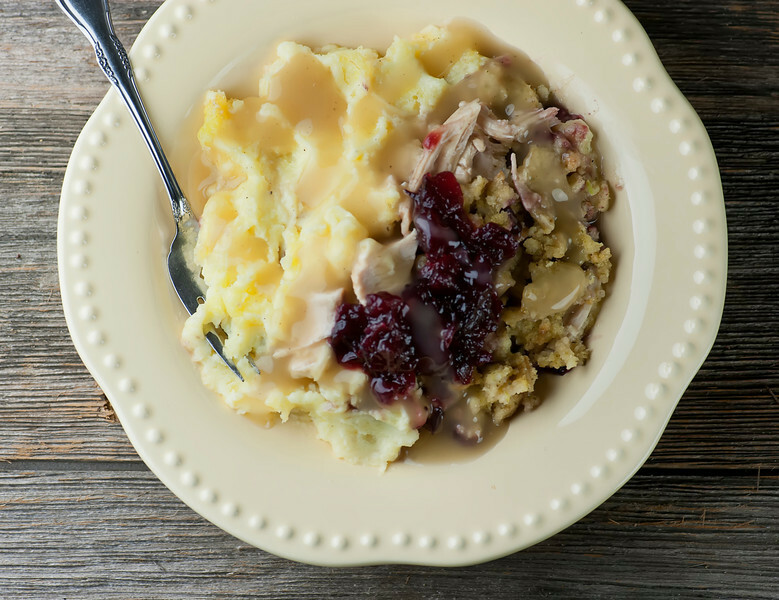 After that, it’s as simple as layering all those leftover goodies into a casserole in this order: stuffing, then gravy, then turkey slices, then cranberry sauce, then mashed potatoes. Dot the whole thing with a little butter and pop it in the oven. Once it is nice and hot, give everyone a good-sized scoop, making sure they get a little of everything. And while this is of course a wonderful way to use up those last leftovers, it’s even more wonderful on a cold March night when Thanksgiving is a distant memory. Just ask at the deli counter for a half pound of roasted turkey unsliced, pick up some pre-made gravy and cranberry sauce, and throw together some stuffing and mashed potatoes. It will zap you right back to the holidays! So hang on to this recipe for those chilly late winter days…you will be thankful you did. Happy Thanksgiving, one and all! Spread the stuffing in the bottom of a 2 quart casserole dish. 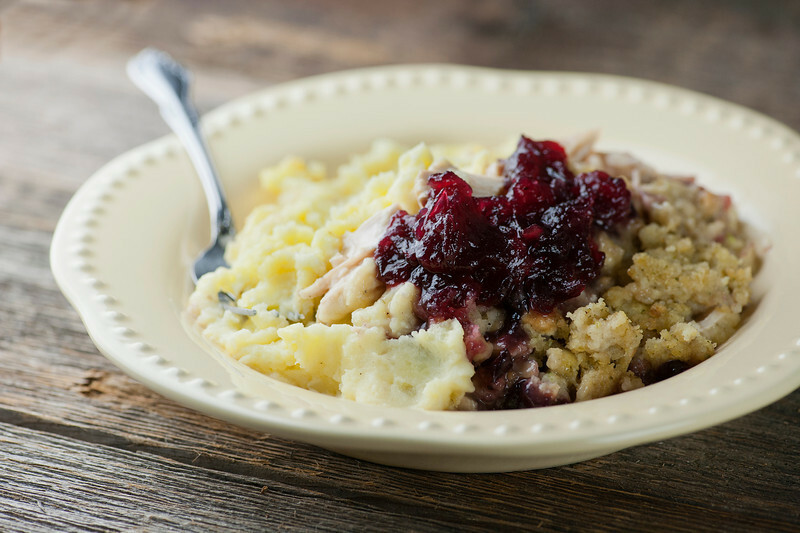 Top stuffing with gravy, then turkey, then cranberry sauce, then mashed potatoes. Dot potatoes with butter and bake for 30 minutes. Serve at once, scooping servings all the way to the bottom so everyone gets a little bit of everything. I love the idea of recreating Thanksgiving in a pan in the middle of winter. Hope you had a good one, chica! Oh this looks delicious! I am craving thanksgiving all over again ;) would love to try this! I made this last night. It was delicious! I will say though, it didn’t look anything like your pictures. It was more like I expected…a mixture of everything Thanksgiving dinner wise in one spoonful. Yummy! I loved thusbrecipie. My entire picky family did. I made it for thanksgiving dinner. I was wondering if u can premake it and freeze it. If so how?